Geographically, North America accounts for a leading share in the market for focal segmental glomerulosclerosis because of the presence of a properly structured health care industry and availability of reimbursement policies with wider coverage. The U.S. is mainly serving to drive the market in North America due to the greater uptake of advanced and high-cost drug therapies, considerable penetration of treatment, and helpful reimbursement policies. Another factor stoking market growth in the U.S. is the classification of focal segmental glomerulosclerosis (FSGS) drugs under orphan disease drugs categories – companies involved in the production and clinical trials of drugs for orphan diseases receive exemption from payment of new drug application fee, provision of tax credits on clinical research, waivers for post-approval annual establishment and product fees, and exclusive marketing rights up to a period of seven years. Europe trails North America in terms of market share. In 2016, the segment accounted for a share of 25.5%. Vis-à-vis growth rate, Asia Pacific is expected to outshine all other regions. The market in the region is being powered primarily by China which in turn is being propelled by the increasing diagnosis rate of focal segmental glomerulosclerosis, stupendous growth in the healthcare industry, and availability of drugs and dialysis at a lower price. Some of the key participants in the global market for focal segmental glomerulosclerosis (FSGS) are Variant Pharmaceuticals, Inc., GlaxoSmithKline plc., Novartis AG, ChemoCentryx, Inc., Retrophin, Inc., AbbVie, Inc., AstraZeneca plc., Pfizer, Inc., Sanofi S.A, and Teva Pharmaceutical Industries Ltd. This report on focal segmental glomerulosclerosis (FSGS) market studies the current as well as future prospects of the market globally. The stakeholders of this report include companies and intermediaries engaged in the manufacturing and commercialization of diagnostic and therapeutic products for focal segmental glomerulosclerosis (FSGS) as well as new entrants planning to enter this market. This report comprises an elaborate executive summary along with a market snapshot providing overall information of various segments and sub-segments considered in the scope of the study. This section also provides the overall information and data analysis of the global focal segmental glomerulosclerosis (FSGS) market with respect to the leading market segments based on disease type, disease management and geographies. The market overview section of the report explores the market dynamics such as drivers, restraints, and opportunities that currently have a strong impact on the focal segmental glomerulosclerosis (FSGS) market and could influence the market in the near future. Market attractiveness analysis has been provided in the market overview section in order to explain the intensity of competition in the market across different geographies. The competitive scenario among different market players is evaluated through market share analysis in the competitive landscape section of the report. All these factors would help market players to take strategic decisions in order to strengthen their positions and expand their shares in the global focal segmental glomerulosclerosis (FSGS) market. Based on disease type, the focal segmental glomerulosclerosis (FSGS) market has been majorly segmented into primary focal segmental glomerulosclerosis and secondary focal segmental glomerulosclerosis. In terms of disease management, the focal segmental glomerulosclerosis (FSGS) market has been broadly classified into diagnosis and treatment. Diagnosis includes segments such as kidney biopsy, creatine test, and others. Treatment includes segments such as drug therapy, dialysis, and kidney transplant. Each of the market segments have been extensively analyzed based on the market related factors such as incidence and prevalence of focal segmental glomerulosclerosis (FSGS), available treatments, and pipeline products. Moreover, historical year-on-year growth have been taken into consideration while estimating the market size. The market size and forecast in terms of US$ million for each segment has been provided for the period from 2015 to 2025. The report also provides the compound annual growth rate (CAGR %) for each market segment for the forecast period from 2017 to 2025, considering 2016 as the base year. 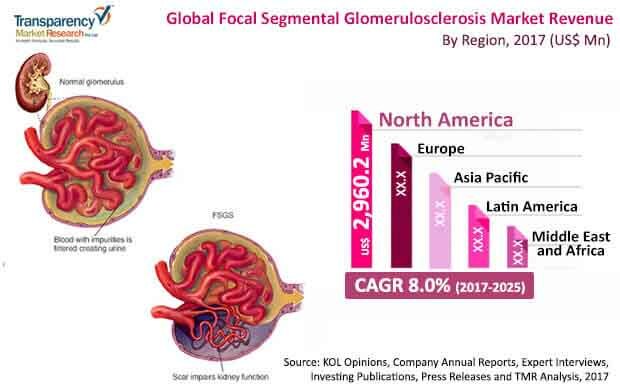 Geographically, focal segmental glomerulosclerosis (FSGS) market has been segmented into five major regions: North America, Europe, Asia Pacific, Latin America, and Middle East & Africa. The market size and forecast for each of these regions has been provided for the period from 2015 to 2025, along with their respective CAGRs for the forecast period from 2017 to 2025, considering 2016 as the base year. The report also provides market size and forecast for major countries in the respective regions. A detailed qualitative analysis of factors responsible for driving and restraining the market growth and future opportunities has been provided in the market overview section. This section of the report also provides market attractiveness analysis, porter’s five forces analysis, and market share analysis by key players, thus presenting a thorough analysis of the overall competitive scenario in the global focal segmental glomerulosclerosis (FSGS) market. The key players operating in the focal segmental glomerulosclerosis (FSGS) market are Variant Pharmaceuticals, Inc., ChemoCentryx, Inc., Retrophin, Inc., AbbVie, Inc., Novartis AG, Pfizer, Inc., AstraZeneca plc., Sanofi S.A, GlaxoSmithKline plc. and Teva Pharmaceutical Industries Ltd. The global focal segmental glomerulosclerosis (FSGS) market is expected to undergo change after the successful pipeline product launch during the forecast period.